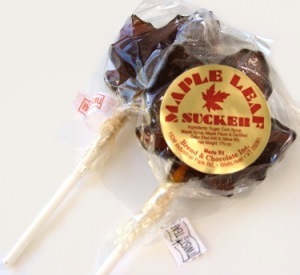 There's lollipops and then there's a hard maple candy lollipop. This one is fashioned after the Vermont maple tree leaf. If you like hard candies and lollipops, you'll love the taste of this one! 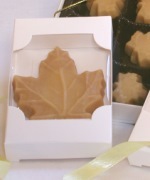 Individually packaged the hard maple candy leaf pop makes an ideal candy gift. Order a bunch and share them with co-workers, or use them as Thank You gifts. A wonderful, unique Halloween treat or Christmas stocking stuffer. Each candy measures 2-3/8" wide x 2-1/2" tall x 5/8" thick. 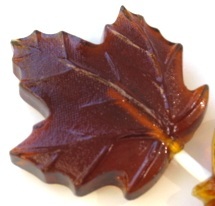 For a closer look at the maple leaf pop, click on the lollipop image to enlarge.